Sorry for the delay in responding but we’ve been en route back to Auckland. I can imagine how excited you and Lilian are about the upcoming arrival. We’ll be thinking of you all in Brazil. Give our best to Richard and Ana. • The northerly estuary (where I invariably fish) was permanently cloudy with visibility of less than 18”. The southerly estuary was tea stained but the visibility was more than 1 metre. • We caught fish at every session in the southern and only in two sessions out of eight on the northern estuary. • There was only fresh snapper sign on the northern estuary on the first and last days. The sign was not where it normally is though so maybe the holding areas have changed? I did not hook anything near the sign though. • There was a shellfish gathering ban (toxic algal bloom) over the entire holiday period. • The northern estuary also smelled as though there had been a sewage spill on or around the 27th. • Last time fishing was this poor was seven years ago. Note that Hamish (Alan's son) landed 6 of the fish on hard bodied lures, including the only fish kept (a 2.5 lb. kahawai). What astounds me is how spectacularly unproductive lures which have a long pedigree of success at Whangamata were. The Binsky blade, for example, did not catch any fish in the northern estuary but worked as per normal in the southern estuary. The distance between the estuaries is only a couple of miles as the crow flies. Water clarity is obviously a factor. The southern estuary is bereft of shellfish which means that it is more of a kahawai magnet. I’m picking that the water clarity and toxic algal bloom kept the snapper out of the northern estuary. One thing that I’ve recently figured out about casting weight forward fly lines is that it is important not to try and cast the thinner running line (as it acts like a hinge and affects the casting loop). It is worth making a mark on the fly line with an indelible pen to show where the taper finishes. Keep this mark just out of the rod tip and you shoot be able to shoot the thinner line and achieve 70’ casts regularly with only one false cast. Interested in your thoughts. Hope the geophysics was more productive than the pike fishing. Alan's comment on geophysics refers to me helping my wife to survey a Roman villa site last week - not really my thing but 'needs must' as they say. Alan clearly had a thin time on the Whangamata estuaries and of course this is how it goes. It poured down (AGAIN!!!!!) here in Dorset yesterday so the rivers will be all over the fields for another couple of days. Anyway, it should be warmer in Brazil. I've added Another one of Alan's emails about some actual fishing (every angler likes that) to show his amazingly realistic smelt flies. Let's hope they are successful. Trust this note finds you and Lilian in the best of everything. Stuart and I got up early this morning to fish the change of light at Tahuna Torea. Just for a change we fished up to high tide which was at 8.00 am. We started fishing just before sunrise at 6.15 am at the area near a hooked sand spit at end of reserve. The current on either side of the spit was steady and even though the tide was coming in the current movement was consistent with an outgoing tide. Strange! The weather was overcast, wind gusting 5 - 10 knots from WSW. Squall with misty rain passed over within first 20 minutes. The forecast was for a cloudy start, no rain and winds from the SE. Cloud to burn off by 9.00 am and a gloriously sunny day. The only thing they got right was the sunny day! We fished initially at the sandpit hook which leads out to point. Fish and bait fish were moving on the shore line exposed to the wind in the half light. It was hard to spot them later with the wind ruffling the surface. Looked and felt very fishy. Steady current, rips and clear water. I opted for an intermediate fly line (WF9I) and orange Clouser initially. Bad choice as I immediately had issues with fly hanging up on the bottom in the waist deep water so changed to smelt pattern. Stuart was using Sassy shad on 3/4 oz jig head. The fly change didn’t make too much of a difference and in hindsight I should have changed to WF9F floating line. We’d had no touches by 8.00 am so started back to car as Stuart had broken his rod (snapped at the ferrule). Bugger! En route back to the car we saw a huge bow wave see sawing between the margins and the shore. Eventually we spotted the fins and realised that it was a large trevally (~ 10 lb.) which was intent on harassing small smelt (1”) long in margins. The bow wave was impressive, just like a bucket being pushed under the water. We chased the leviathan for 75 minutes during which time it had moved over 750 metres along the shore line. It kept on angling into shore and then moving back out into deeper water. Every time it got within range I was firing out casts but it never showed any interest in the fly as I couldn’t quite get close enough to intercept it. Awesome fun. Just like trout working a back water. Stuart tried fishing with half a rod and on one occasion we think it attacked the Sassy shad but it did not hook up and just kept on working its beat. Interestingly three shags were attracted to the activity and started helping themselves to the bait fish that the trevally was corralling in the shallows. It did not give a jot and relentlessly continued herding prey shorewards. It was a very focused fish, an apex predator, master of all that it surveyed. I think that we may have stumbled onto something. At high tide, there is no boat activity as we are fishing about 1 kilometre away from the main channel. It is quiet, the water is clear and the flooded seabed, which is shell and mud, is a haven for bait fish , crabs and shrimp. I’m picking that what we witnessed with the large trevally is the norm rather than the exception. Definitely going to give it another try and soon! How about that? Well worth a few more trips I would say but perhaps a little plug or a livebait would be my choice. Nevertheless, if Alan can reach the fish with his fly I expect he might catch one. Anyway, the next email was to show me the new flies. 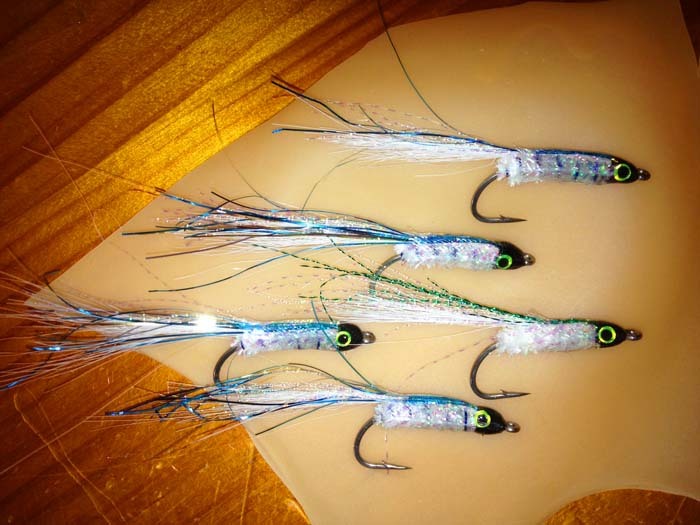 Thought I'd tie some smelt flies given our brush with the XOS trevally this morning. Not quite a school of smelt..."a classroom" perhaps? ?